The John Deere XUV560 is the latest addition to the company's crossover utility vehicle lineup. 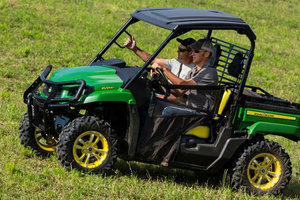 John Deere announced on June 16 that it has updated its crossover utility vehicle lineup, adding the Gator™ XUV560 and XUV560 S4 to its collection. These mid-sized models have V-twin engines and independent four-wheel suspension for a smooth, quiet ride. Both models have sealed under hood storage and a cargo box designed to resist rust and dents. "This update to our Gator family provides even more options for our customers to choose from," said Mark Davey, John Deere marketing manager for Gator utility vehicles. "The XUV560 was crafted to deliver all the bells and whistles you expect from John Deere, at an attractive price tag." The V-twin gasoline engine of the John Deere XUV560 and XUV560 S4 features quiet idling, reliable cold-weather starting, and mid-range power delivery. Both models can accelerate up to 28 mph quickly. The vehicles feature either two or four seats to accommodate multiple passengers. There are also 75 different attachments that can be used, ranging from lights to racks. The tailgates of the John Deere XUV560 and XUV560 S4 are designed for truck-like performance and they only require one hand for operation. Finally, these John Deere Gators were made with comfort in mind. The four-wheel suspension of the vehicles provide a smooth, comfortable ride, even on the roughest terrain. For more information on the John Deere XUV560 and XUV560 S4, contact your local John Deere dealer or visit www.JohnDeere.com/Gator.